How to make Thanksgiving Explosion slime! With perfect fall colors, you can make your own version of rainbow explosion slime that fits perfectly in the Thanksgiving and fall themes. This super fun homemade slime recipe will bring sensory play and fun to your fall. Look below to learn how to make thanksgiving slime! Before you get started on making Thanksgiving Explosion slime, you need to create your favorite slime with your favorite slime recipe! When I am making slime for “explosion” slimes, I love to use white. I feel like it has the best streaking of colors but do not be afraid to color your slime and use other colors like pink, purple, yellow or blue! Just do your best to keep them pastels and not to over mix the slime coloring. 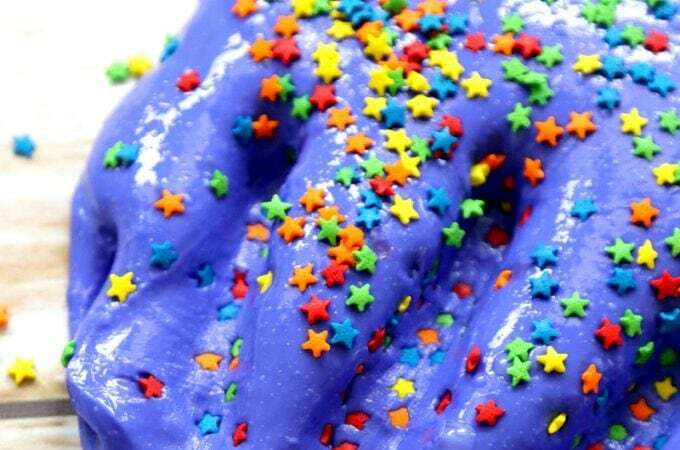 It is harder to see the sprinkles on the slime if its too dark. And yes, you can mix the colors like we do in our unicorn poop slime! Can you make Fluffy Slime? Yes! You can make fluffy slime, saline solution slime or regular starch slime and it will work fine with this kind of sprinkles in your slime. Because I like my slime to have lots of stretch, I prefer a basic slime with starch for my base. That being said, adding shaving cream to your slime makes it less messy and many parents and kits prefer that texture. You can learn how to make glow in the dark slime and get the ingredient that will make any of these slime recipes glow in the dark. Really! White school glue – I always use GALLON SIZED GLUE. 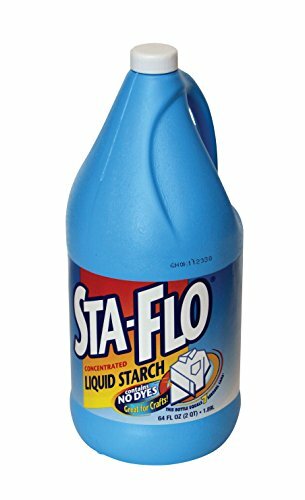 Slime projects always lead to more slime and you cannot get a gallon in the store. I highly recommend just getting the big one as a more cost effective strategy. Nonpareils – You need tiny rainbow round sprinkles. 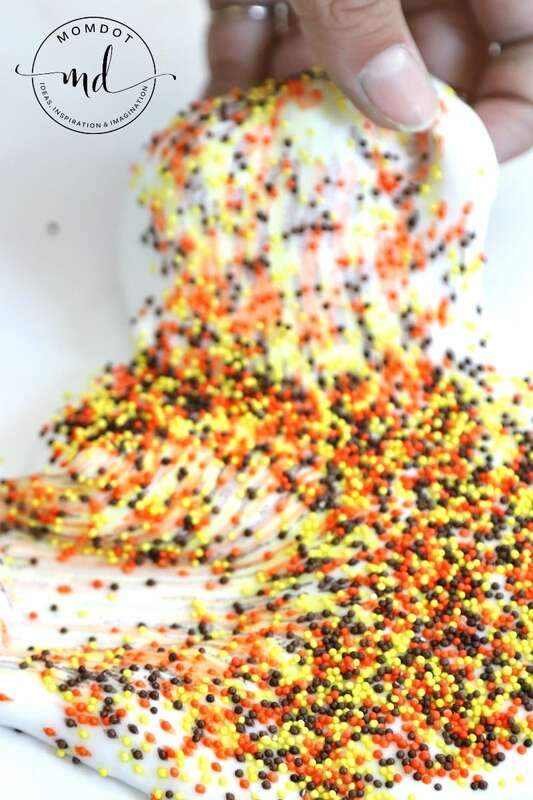 You can do larger or shaped sprinkles, but these round ones make the best streaks! Get a lot of them because they fade into the slime when you are done, so you will need to keep sprinkling the longer you play. How do you make Thanksgiving Slime without Borax? To get started, pour your glue into a bowl. I use about 1 cup, which is equal to 8oz of white glue . 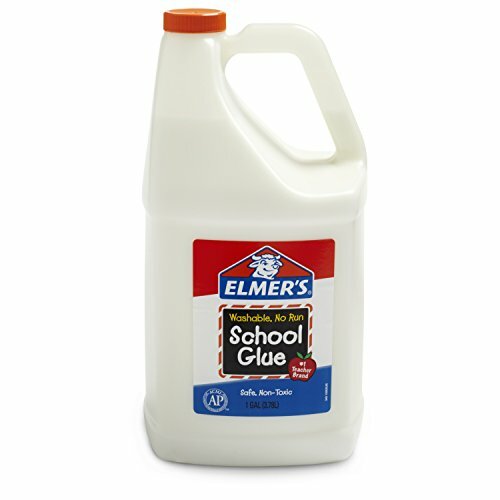 I use Elmer’s glue and buy it in the gallon container. Now you can dye your glue by dropping a bit of food coloring into your slime. Stir until there is no white left. In the case of the slime shown below, I did leave the glue white because I prefer that in my thanksgiving explosion slime. Add liquid starch, about 2 tablespoons at a time, and stir. Your slime should begin to form into a solid immediately. Stir until its in a ball and then take out and knead like bread. Your slime will get less sticky as you kneed and stretch it (Video below). If your slime does not start to peel off your hands in about 2-3 minutes, add more starch. Once your slime is made, simply let it spread out on a vinyl. I like using vinyl mats because it keeps the colors of the slime from bleeding into the floor and you can really get involved with playing. You can also use a wipeable place mat! Your slime should start to slowly spread out like cookie dough. Now that its ready, time to get busy with the sprinkles! 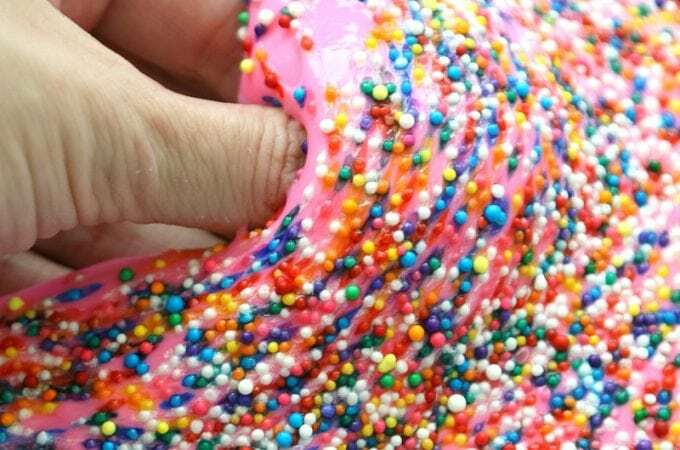 Sprinkle your holiday Thanksgiving non pareils on your slime and let sit for about 30 seconds. Letting the sprinkles sit allows the colors to get slightly wet. Now you can slowly stretch your slime and see all the awesome streaks. 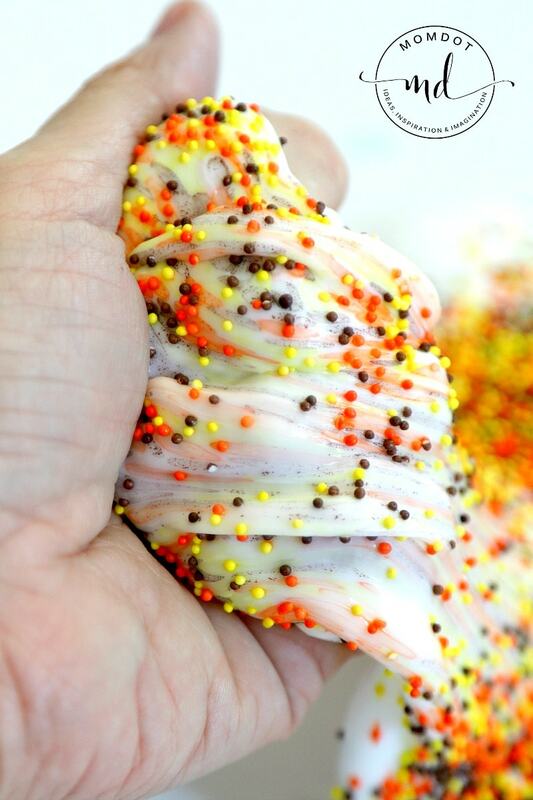 This is a really fun slime to make and kids of all ages LOVE Thanksgiving Explosion slime! Want to see more sprinkle slimes? 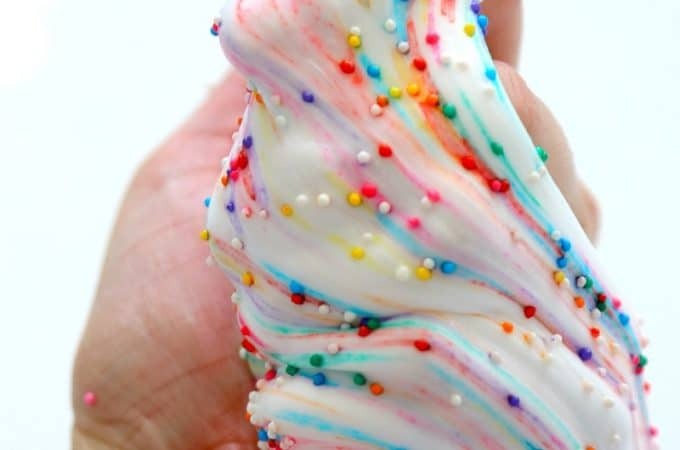 Head over to see 10 Stunning Sprinkle Slimes here!